order propecia pills I have one last recipe to share from the Friday the 13th Dinner Party, but it will have to wait until next week. I’ll post that and the party wrap-up on Monday along with the full menu and recipe links. 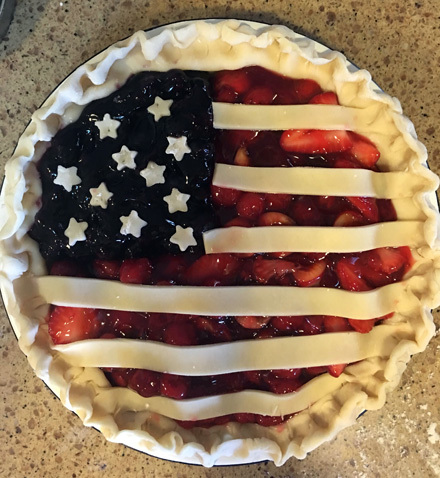 here The reason it is put on hold is because I must share the recipe for the most beautiful pie in the world – in time for you to make it for the long Memorial Day Weekend. Just in case you’re new here, you should know that I don’t enjoy baking. I’m not very good at baking. I have had and continue to have more than my fair share of baking disappointments and disasters. 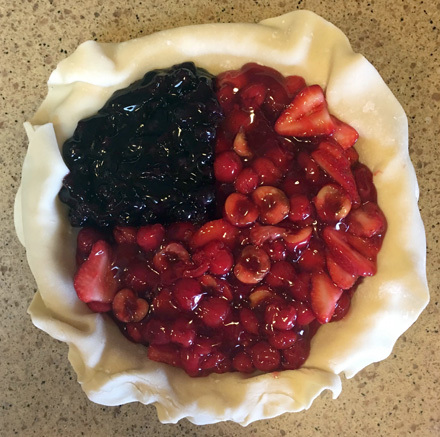 So much so in fact, that a while back I was contemplating changing the name of this blog to “Cooking Triumphs and Baking Failures.” Not anymore, not after my spectacular and unexpected triumph in baking the source link most beautiful pie ever! Are you ready to be blown away? OK then, here we go…. Am I right? Seriously, that is one gorgeous pie! I don’t know how I did it – but Victory is Mine! Even the crummy crimping job looks good on this pie. It looks like it was intentional, as if I wanted it to look uneven and rustic. Thankfully, it doesn’t look as tough I just can’t crimp evenly. 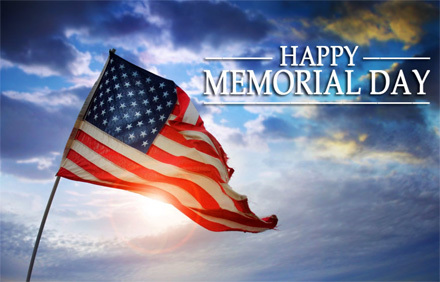 As for the uneven browning on the stars and stripes? That was a happy mistake. 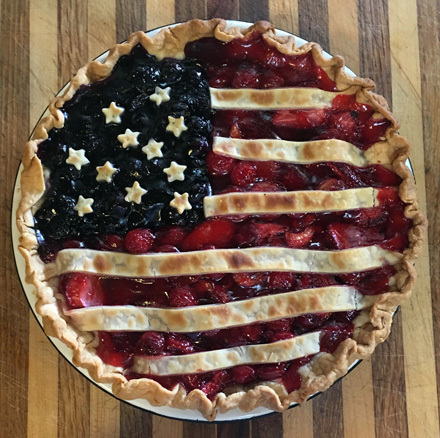 The outside crust browned nicely but the stars and stripes were pale and anemic looking when the pie was finished baking. So, I turned off the oven and turned on the broiler. 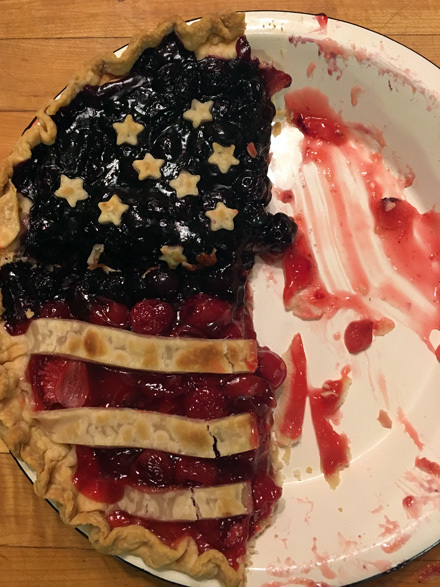 I made a foil collar for the outside crust and put the pie under the broiler and watched it Very Closely and … voila, I ended up with a lovely “old flag” look. 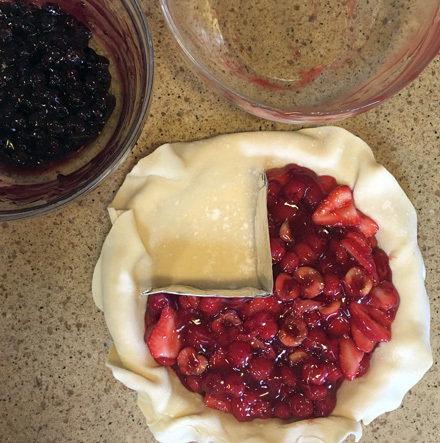 In a medium bowl, mix the strawberries and pitted cherries with the cherry pie filling. 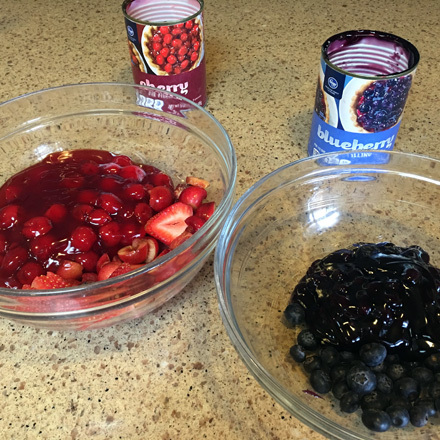 In another bowl, mix the fresh blueberries with the blueberry pie filling. 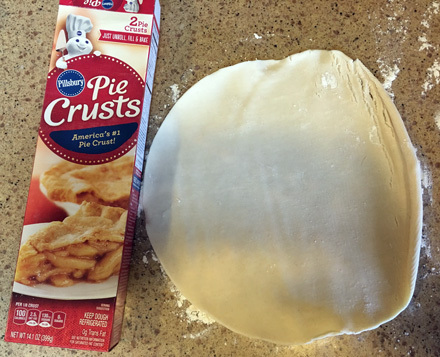 Remove one pie crust round from box and transfer dough to a pie dish, pressing into the bottom of the dish. Be sure you have an overhang of about an inch all around. You may need to roll out the dough slightly, depending on the size of your pie dish. 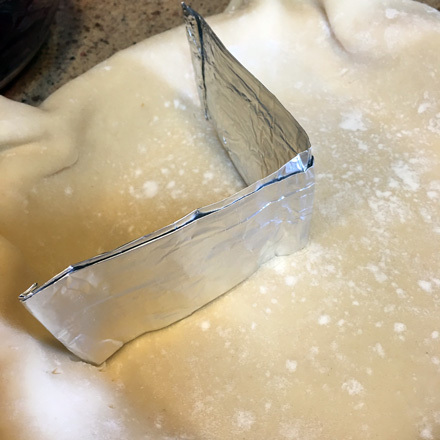 Fashion a piece of foil into an open, 2-sided box, to fit from the center of the pie, into the corner of the pie pan. This is used as a divider for the fruit fillings. 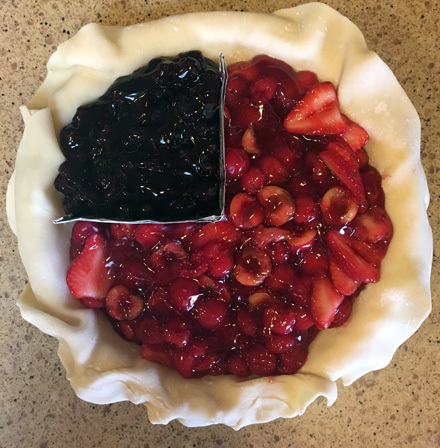 Carefully spoon the red filling into the large portion of the pie. Then carefully spoon the blue filling into the corner of the pie. Slowly and gently remove the foil divider. Preheat oven to 425 degrees. 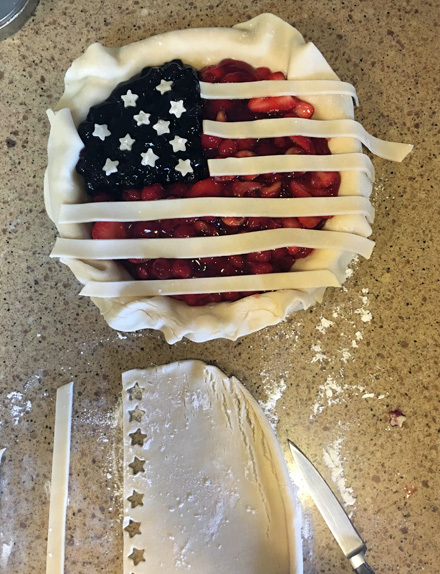 Remove the second disc of pie dough and cut into strips and use a tiny star cutter to cut out little stars. 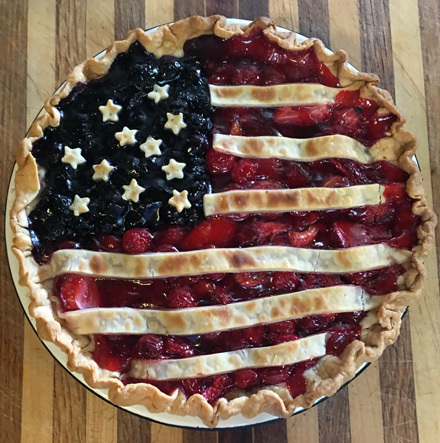 Carefully place on top of the fillings; stripes on red and stars on blue, crimp the edges of the pie. Place the pie on the center rack and turn down oven to 400 degrees. Bake for about 30 to 40 minutes, until the crust is golden and the juices are bubbling. 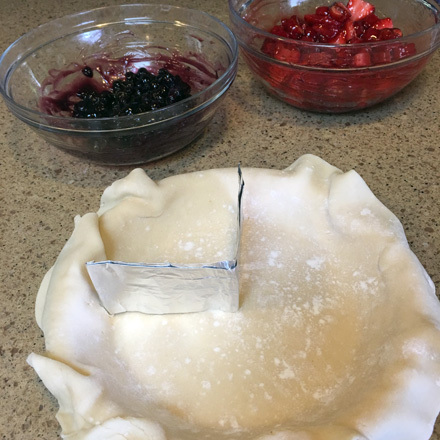 Cool the pie before slicing to allow the juices to firm and settle. 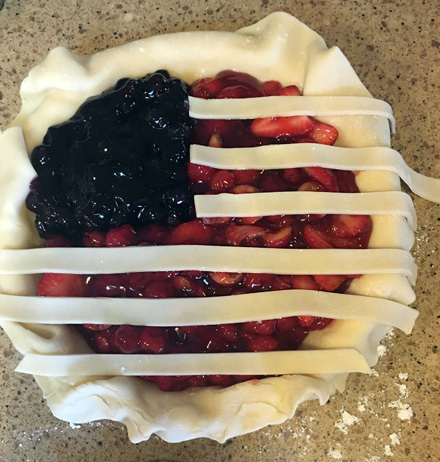 The pattern works so well, the literal American pie!